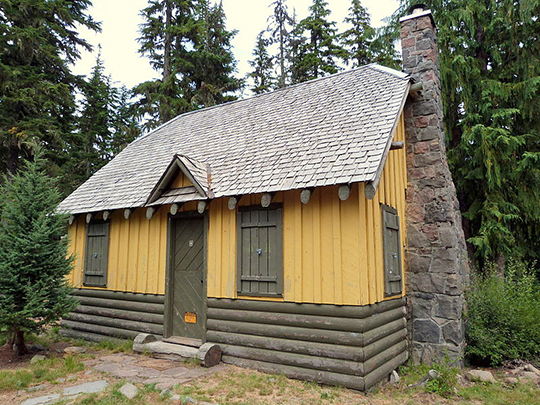 Photo: Olallie Lake Guard Station, ca. 1939, Forest Road, near Olallie Lake, Mount Hood National Forest, OR. Listed on the National Register of Historic Places in 1991. Photographed by user:Ian Poellet (own work), 2010, [cc-by-3.0 (creativecommons.org/licenses/by/3.0)], via Wikimedia Commons, accessed January, 2014. The Jefferson County Courthouse is located at 75 SE C Street, Mardras, OR 97741; phone: 541-475-4451. Jefferson County is located on the eastern side of the Cascade Mountains in Central Oregon. It was established from a portion of Crook County on December 12, 1914 and named for Mount Jefferson, which is on the county's western boundary. The county's western border is the crest of the Cascades. Most of the county lies in the Deschutes River Drainage Basin. A small area in the northeastern corner of the county is part of the John Day River Basin.